Featured here is a unique new design for a Strat® tremolo arm; The "Drop Trem". 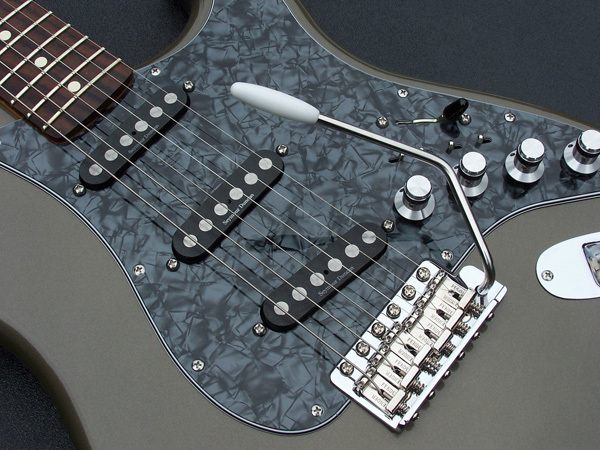 As you already know, when in use, the standard Strat® tremolo arm comes straight toward the neck as it comes up and out of the bridge, with the "Drop Trem" design it drops down at an angle before turning and coming back toward the neck (as depicted in the photo to the right and below). This in effect lowers the tremolo arm and places it in a more forward and natural angle within the hand when swung into the playing position. This drop is NOT referring to any relationship between the tremolo arm tip-to-pickguard distance. The "Drop Trem" design is very comfortable for those that like to hold or rest the tremolo arm in their hand while playing, it also facilitates palm muting of the strings with ease. You will find that the "Drop Trem" tremolo arm is a unique improvement over the standard or traditional Strat® tremolo arm style. Each of our "Drop Trem" tremolo arms are custom manufactured by hand from Precision Ground 303 Stainless Steel in three lengths for the Fender® Stratocaster® style of guitars. 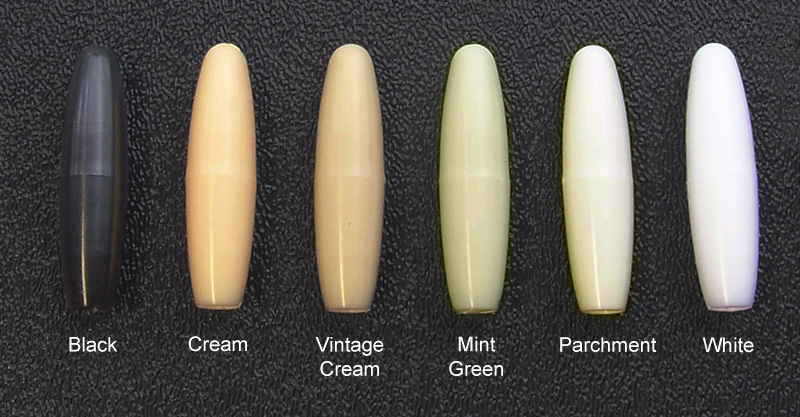 The Precision Ground finish provides a very smooth and clean appearance. The 303 grade of stainless steel offers strength, durability and excellent machinability to produce clean accurate threading. The "Drop Trem" tremolo arms are threaded at the attachment end in either American UNF 10-32 or Metric 5mm threading, they are also threaded on the tip end to accept standard plastic tips. The "Drop Trem" is manufactured for right handed guitars only. If you have one of those half-thickness tremolo blocks on your import bridge then our custom tremolo arms won't have the proper bend angle for that style of bridge, those bridges accept the tremolo arm into the block at a 10 degree different angle than the typical Strat tremolo bridge. You can confirm this by the removal of the back plate on your Strat and looking at the bottom of your tremolo block where the tremolo tension springs clip on, the tremolo block will only be 1/4" thick and that is not what you want to see, so don't purchase one of these tremolo arms for that bridge. Lengths are measured from the center of the first bend as it comes up and out of the tremolo block to the tip. 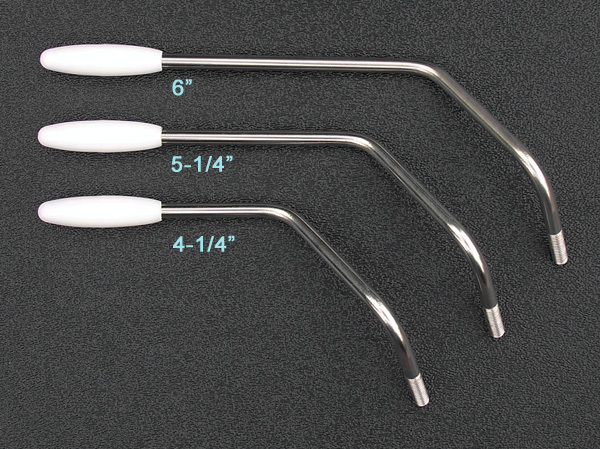 Each of these tremolo arms are custom manufactured for each order, they do not qualify fore return, exchange or refund. Give us up to 5 days to get your tremolo arm complete. The above photograph shows the 5¼" Intermediate Length "Drop Trem" tremolo arm. IMPORTANT: All tremolo arms must be screwed completely into the tremolo block all the way until it stops to a point where the last of the threaded portion goes at least 1/4" below the surface of the bridge plate. If you fail to install your tremolo arm correctly you will eventually experience failure of the tremolo arm.